This is inflammation of the nasal lining. This swelling or bogginess blocks the nose and can make it difficult to breathe. Sometimes this blockage only affects one nostril at a time and can depend on which side you sleep on at night. This can be caused by allergies or infections. 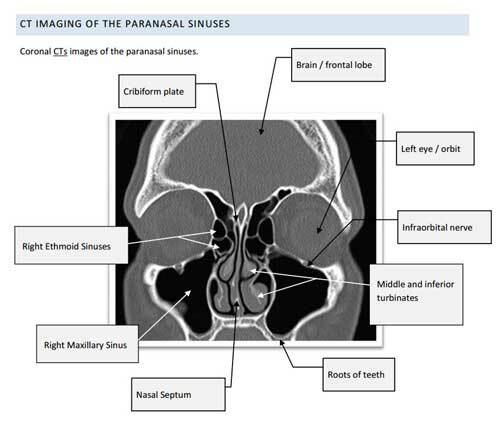 Infections of the nose are covered on the sinusitis page. These are extremely boggy areas of nasal lining that have expanded to such a degree that they look like clear grapes within the nose. We do not completely understand why this happens and why it happens to certain individuals, but we are learning more about how to treat these polyps and what measures are needed to stop them being so distressing. The septum is the middle partition of the nose, and normally it lies roughly central within the nose allowing air to pass equally on both sides. Occasionally it can be more prominent on one side rather than the other, and therefore lead to an airflow blockage on that side. Occasionally it blocks both nostrils especially if the septum bends one way and then the other. This type of nasal blockage rarely improves even with nasal sprays. This is a hole in the septum which can be caused by a number of different drugs, medications, diseases and even nose picking. Normally these cause no problem, but they may cause crusting within the nose, a whistling noise when speaking, and also a feeling of nasal obstruction. The septum can be completely straight, but with a hole within it some people feel blocked because the airflow is not right anymore. The hole disrupts the direct flow through the nose and leads to more turbulent flow. 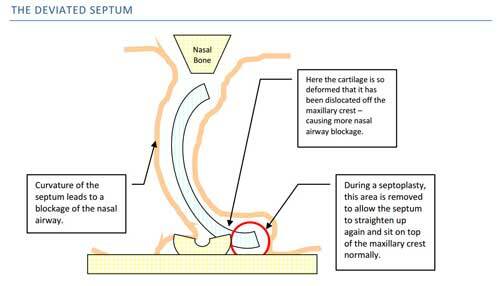 The nose interprets this turbulent flow as a blocked nose and can cause significant difficulties for patients. Nasal sprays would not help, so operations are required to deal with this problem. These can range from the very simple (could be done with a local anaesthetic), to a very extensive. The choices depend on each clinical case, and Mr Vik Veer will be happy to discuss this with you. Fortunately these are very rare, but should be suspected if one side of the nose is increasingly getting blocked with sometimes symptoms of bleeding, numbness around the face, swelling of the face, and loss of sense of smell. If you are worried that you might have a serious problem in the nose, the advice would be to see your General Practitioner as soon as possible and ask for an urgent appointment with an ENT surgeon. The NHS is extremely good at dealing with cancers and other extreme circumstances. Most patients are seen within 2 weeks. Of course Mr Vik Veer will see patients with these symptoms, and if there are any concerns after examination in clinic the normal plan would be to refer you to a local hospital or perform the scans and biopsy privately. Once the diagnosis has been made, treatment in a NHS cancer centre is very important as you will have the benefit of multiple experts looking after you. House Dust Mite excretion – this is found in almost all houses in the UK. They are found in carpets, duvets, pillows etc. Grass / weed / tree pollens – this is often known as hay fever. Latex – people who use latex gloves at work. Normally begins with a slightly sore or rough hands and progresses to worse symptoms over the years. A large percentage of NHS workers have Latex allergy without knowing it. Testing for these can be done by a blood test or a skin prick test. There are advantages and disadvantages for both of these, but generally they only test for the most common problems. There is still a possibility that even though your test was negative, you could still have an allergy, albeit a rare one. Having a history of eczema, asthma, or food allergies even only as a child, makes the possibility of having allergic rhinitis more likely. There are a number of different treatments for rhinitis, and choice is based on the symptoms experienced. For example a patient who has itchy throat and eyes with mild nasal blockage is treated very differently from a patient who only has a blocked nose, and again very differently from the patient who has a very ‘drippy’ nose. Understanding what the main problems are and what you want fixed alters the management considerably. There are a variety of different sprays available, and some steroid sprays are better than others. Some patients do not need steroid sprays, but require a completely different spray altogether. Because nasal decongestants cause such a problem in some patients, more detail about the seriousness of decongestant use is provided here. Otrivine, Sudafed or Vicks sprays should only be used for 7 days total. These sprays are very quick acting and give fantastic relief from a blocked nose for about 12 hours, but it is very important to understand that they can only be used for a very short time. The reason for this is that these drugs reduce the blood flow to the nose, which in turn reduces the bogginess of the lining of the nose. There is only so long that the nose can cope with no blood flow and when the effect of the decongestant wears off the body pours blood back into the nose to give the structures vital nutrients. This has the effect of making the blocked nose worse than it was before. Long term use of decongestants leads to its effect lasting for a shorter time, so that patients are seen constantly spraying it up the nose all day, rather than just once or twice. It is similar to being ‘addicted’ to decongestants and can cause structural problems in the nose with the nose being permanently damaged and requiring operations to solve the problem. Mr Vik Veer has experience with this condition (known as Rhinitis Medicamentosa), and would be happy to help you fix this problem. The first step is coming off the decongestants, as it is impossible to fix this problem whilst still on these drugs. You will need maximal treatment with a host of other sprays, before considering surgery. Mr Vik Veer will be happy to discuss the management plan with you, as it is generally slightly different for everyone. Sometimes people simply cannot use steroid sprays, and look for alternative treatments. Mr Vik Veer is currently researching non-surgical treatments for a blocked nose, and a trial for this device is due to commence in 2017. 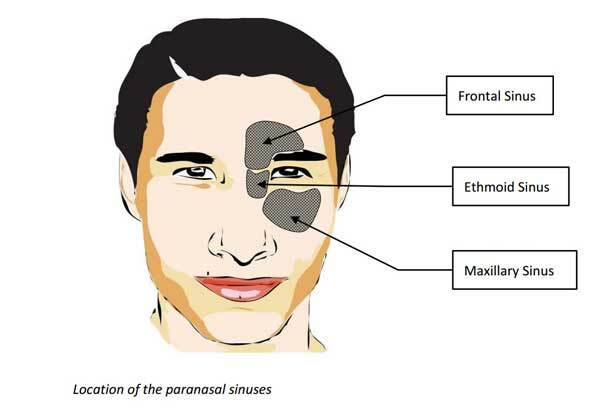 People breathe predominately through the inferior part of the nasal cavity next to the septum (marked with a red circle in the diagram). Opening this area helps patients the most with their breathing. Operations a mainly divided into those that act on the septum (the middle partition of the nose), or the turbinates (bony protrusions from the side walls of the nasal cavity). 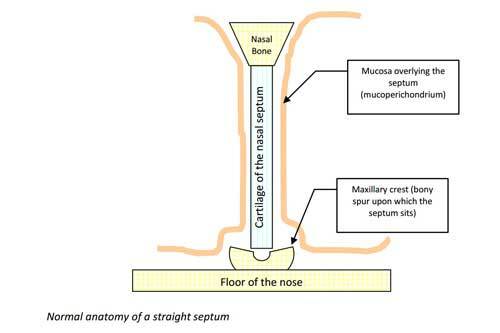 In the diagram below there is a case of a straight septum, but turbinate that is blocking the nose. 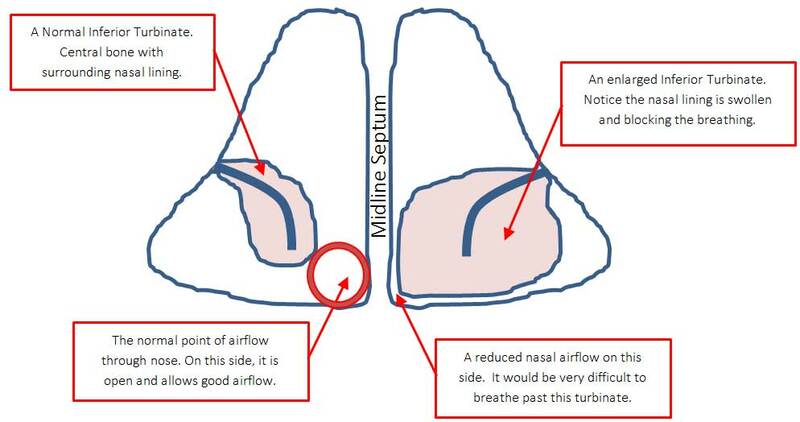 As you can see, the turbinate on the right of the diagram is blocking the nasal airflow as the septum is not blocking the nose. 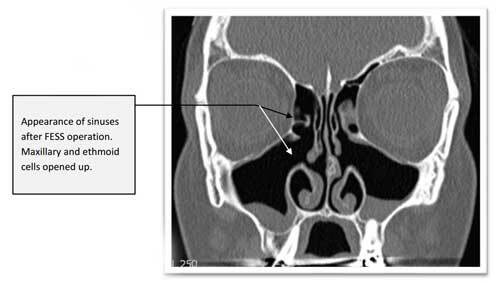 In this case this turbinate should be treated to improve the nasal airflow. This assessment can be made in clinic and the options provided without any surgery being performed. Radiofrequency Ablation is a procedure that can be done under local anaesthetic if you wish as it is not too painful and only lasts a few minutes. It is much safer than the older techniques, as it causes less damage to the nose and is more precise. There are very few complications with this treatment and Mr Vik Veer will be happy to explain this all to you as he has taught other senior consultants this technique. Occasionally the bone within the turbinate is the problem rather than the lining. There are some options here as well, some are very minor, and some are longer operations. A septoplasty is when the middle partition of the nose is operated on. The septum can be bent, fractured or just too big for a number of different reasons. In these cases sprays have little or no effect on the breathing and really the only option is an operation. In some cases it might be worth considering the smaller turbinate operations just in case that helps enough to avoid a septoplasty operation. A septoplasty is quite a short operation lasting about 30 minutes in most cases, but it will mean that you should take a week or so off work to aid recovery and healing. It doesn’t require any incisions that you can see from the outside (everything is done within the nose), and the vast majority of patients may go home the same day. Although it is considered a minor procedure, Mr Vik Veer does try his best to avoid causing any distress or discomfort and will explain all the options before suggesting a septoplasty. If you would like more information about septoplasty, Mr Vik Veer will be happy to discuss this with you. Occasionally the external structure of the nose is also deformed, and a rhinoplasty (‘nose job’), is also required. Mr Vik Veer does not perform cosmetic procedures, but he will advise you of the consultants that have the best results in the country. Removing nasal polyps is actually quite straightforward, however reducing the chances of them returning is quite a lot harder. Generally ‘polypectomy’ can just mean removing the bulk of the polyps allowing improved breathing, but there is a significant chance that they will grow back even with steroid sprays. Clearing out polyps from their ‘roots’ and opening up these areas so steroid sprays prevent polyps from growing back has been shown to reduce the chance of the polyps growing back. Avoiding multiple operations is something Mr Vik Veer is very keen on, and he will advise you on the various options for nasal polyps. The most important thing to remember is that the polypectomy operation does not ‘cure’ polyps, it merely cleans them out temporarily. The vast majority of patients will need steroid sprays to avoid another operation again. Mr Vik Veer uses medication before any procedure to try and avoid surgery if at all possible, and there are a number of therapies that may help with nasal polyps. 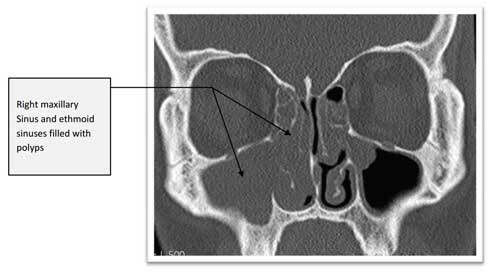 There are a number of reasons why someone may develop a hole in the septum (this is the midline partion of the nose). There are a number of techniques to close this hole as many people feel that it makes a whistling sound when they speak and causes the sensation of nasal obstruction. Septal buttons are very easy to insert, but they often cause crusting and other difficulties. A septal perforation repair is a major operation and is often not successful or too large an operation for most people. There are operations that lie between these two options. Mr Vik Veer would be happy to discuss these options with you in more detail.